She had a dream – Pasang Lhamu Sherpa wanted to be the first Nepali woman to summit Everest and in 1993 she did it but paid the ultimate price. The documentary The Glass Ceiling tells her story but needs funding to bring it to market. Let me say on a personal note, that the more I dug into this story, the more I join the chorus that it must be told. If you read nothing else, watch the trailer … then I bet you will come back and read the rest of this post and make a donation – I have. Filmmaker Nancy Svendsen learned of Pasang’s story through her brother-in-law, Ang Dorjee Sherpa, and thought, “the world needs to know this story!” She brought in New York Times bestselling author and Everest sumitteer Alison Levine as executive producer. Pasang’s story is mostly unknown outside of Nepal. Her desire to climb Everest was met with opposition from the beginning. While Sherpa men had been climbing Everest for half a century, Sherpa women were expected to stay home, bear children, and perform domestic functions. But Pasang refused to give up her dream. Although she was born into poverty and never learned to read or write — she had the courage to fight sexism, racism and even the Nepali government for her right to climb Everest. The film tells her story not only as a climber but also as a woman with a dream who broke through barrier after barrier. Now another barrier stands in the way of bringing her story to the world – money. The film team has opened a crowdfunding campaign and is grateful for your donation in any amount. AA: Nancy, can you summarize the moment when you knew you would make this movie? NS: When my brother-in-law Dorjee Sherpa told me the story of his sister, I felt an immediate connection to her. Her passion and determination to do what everyone told her she couldn’t do was inspiring and stirred the storyteller in me. Here is the greatest contemporary Nepali hero, with a statue in Kathmandu, schools, streets, a hospital and even a mountain named after her – yet no one has ever told the story outside of Nepal. This was astounding to me. I decided right then I wanted to make this film. AA: Nancy, your sister is married to Pasang’s brother Ang Dorjee so would you share your insight into why the Sherpa community discouraged women on Everest in the early 1990s? NS: While Sherpa culture defined a woman’s role as mother and homemaker in the 1980s and 1990s, Pasang’s greatest obstacles were not necessarily the Sherpa community. While her parents weren’t happy with her relentless independence at an early age, when she escaped her arranged marriage to run away and start a new life in Kathmandu with her chosen partner, Lhakpa Sonam Sherpa, she found greater obstacles in the caste dominated Nepali society there. Sherpas were literally outside the caste system – “outcastes”. They didn’t speak the language of the government officials. They had no guaranteed civil rights. When Pasang and her husband started one of the first Sherpa owned trekking companies, they faced multiple hurdles in getting permits and permissions from the government. When Pasang directed her ambitions towards Everest, she was summarily dismissed by everyone. Her first chance at Everest was on a French expedition in 1990 where she was not allowed a chance to summit. This disappointment fueled her decision to put together the first -ever Sherpa sponsored Everest expedition. Her path toward that goal was met with opposition at every turn. AA: Alison, you have written a book based on your expeditions and as an adventurer yourself with the Adventure Grand Slam (7 Summits & both Poles) — what touched you about Pasang’s story as a fellow female adventurer? AL: Many things touched me about her story. First: I have always felt that it’s important to honor the people who put forth the effort in order to break trail for others. Pasang did that in so many ways. I admire her sense of determination and her courage more than words can express. And then of course I can relate to her because I know how it feels to be part of a high-profile Everest expedition (2002 American Women’s Everest Expedition) and not make the summit — and then feeling like you let people down. It took me eight years to get up enough courage to go back and try again. Pasang went back four times and was never discouraged. Wow. AA: Alison, when you summited Everest in 2010, do feel women, especially Sherpani are more accepted on Everest than in Pasang’s time? AL: Absolutely! There are so many Sherpani just absolutely crushing it out there in the mountains now. Look at Pasang Lhamu Sherpa Akita, Dawa Yangzum Sherpa, and Maya Sherpa. They are out there taking on some of the toughest 8000m peaks on the planet.And every time I read about them I just do a happy dance (I think I may have actually torn my Goretex pants with my crampons in the process :-)). And we have great interview footage in the film where Sherpani women who have sumitted Everest talk about how Pasang motivated them to climb — and that’s a testament to how things are different today. And Pasang is the reason things are different now. AA: Nancy, what has been the largest challenge telling Pasang’s story beyond funds? NS: Had Pasang lived, I would be connected to her through marriage. Pasang’s family has been extremely generous in turning over everything they have in the way of archival material to me, but honestly that is still not very much material. I have no photos or videos of Pasang as a child as her family was too poor to have a camera. Her Everest expeditions didn’t include the budget for a cinematographer. Much of the video I do have of Pasang is from Nepali TV – press conferences she held, coverage of her massive funeral in the streets of Kathmandu. I have conducted an extensive search for still photos of her. I have so many friends and family telling me of her warmth, charisma and beauty in interviews – but making her come alive for the audience has been a true challenge. Helping the audience connect emotionally with Pasang has been my biggest challenge. AA: Nancy, what impression do you think Pasang would have wanted viewers of the film to have after watching it? NS: I think Pasang’s dream was, yes to summit Everest, but in the bigger context it was to be allowed the same opportunities as women and men coming from more advantaged economic and cultural backgrounds. She didn’t want to be confined by the cultural norms of her birth. She chose to climb Mt. Everest as it was, for an uneducated Sherpa woman, THE way to make her world bigger and have a seat at the proverbial table. I know Pasang would be deeply moved and proud of all the advances Sherpa and Nepali women have made in the decades since her death. I think Pasang would hope for men and women watching the film to be inspired to reach for “their own Everest” in whatever the situation in their own lives. AA: Ang Dorjee, you knew Pasang as she was growing up. What three words would you use to describe her? AA : Ang Dorjee, can you help us understand her impact on the young ladies throughout Nepal? Dorjee: She proved to young women that no matter what obstacles were in her way, with education or without education, if you pursue your dream, you can do it. She was inspirational for all women in Nepal. Thanks to Nancy and Alison for working to honor and keep Pasang’s legacy alive. Let me say on a personal note, that the more I dug into this story, the more I join the chorus that it must be told. If you read nothing else, watch the trailer .. then I bet you will come back and read the rest of this post and make a donation – I have. Here in Nepal, one of the mandatory prescribed text book had a chapter on Pasang’s story and achievements. Hope they have not removed it. 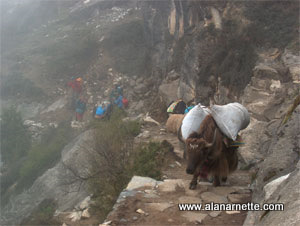 Pasang’s husband Lakhpa Sonam Sherpa operates Thamserku Trekking. His family also operates Asian Trekking, Yeti Air, Tara Air, Himalaya Air and other numerous businesses. His family along with brother Ang Tshering Sherpa is regarded as one of the most successful tourism businessmen of Nepal. Hope they can help with the funding of the documentary.